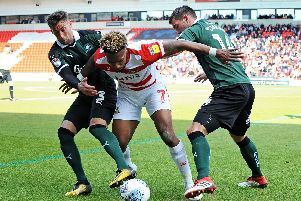 Frenchman Mathieu Baudry says the way Doncaster Rovers have grown into League One bodes well for next season. Rovers travel to Gillingham tomorrow hoping to follow up important wins against Bradford City and Blackpool - and continue their ascent up the table. Darren Ferguson’s side have unquestionably matured and shown more of a resilient streak as the season has wore on. And Baudry says one player in the squad in particular mirrors that progress. “Alfie Beestin epitomizes it really,” said Baudry. “He started off a bit shy. “But now he’s got the confidence and feels ‘I belong on this pitch and I want to be the best player here’. “A lot of it is about confidence. “We’ve got a lot of young players and I think at the start of the season, because it was our first season in this league, we were maybe tiptoeing. “You maybe don’t think that you belong here and you put a limitation on what you could do. “Now I think we’ve got more confidence, we’ve got a few wins and we start believing. “I think it’ll be good for next season,” he added. “I had this in my first season at Leyton Orient. We had a lot of changes at the start, we were 19th, and then we went on a run and finished just outside the play-offs. Whether Baudry, who is out of contract this summer, is still around next season remains to be seen. His two years at the club have both been punctuacted by injury setbacks in pre-season. The 30-year-old centre back, set to continue alongside Joe Wright at Priestfield, has been restricted to 21 appearances this term - but has appeared on the losing side just three times. “I feel like I bring something to the team,” he said. “But I feel like we’ve only seen a little part of what I can do because I’ve never really been 100 per cent, I’ve always missed the start of the season. “I came back from injury and feel like I’ve done all right still, but being honest I’m looking forward to having an off-season where I can put some graft in and get a good pre-season and show what I can do.